Well I promised you all something special for this blog post and unfortunately I have failed to deliver. I was planning on rewriting 21 seconds by So Solid Crew to 21 Days and making it triathlon specific. Unfortunately the lyrics are far too complex for me to be able to rewrite. I did have a go at the chorus (see below) but it made no sense so I abandoned the project. "I got 21 days to goI got 21 days to goCause if you support me let me knowIt’ll be a good showI got 21 days before I do the showDid you see me on the swim, oh noDid you see me on the bike, oh noSo if you support me let me knowCos my run is so slowI got 21 days before I do the show Did you see me on the swim, oh noDid you see me on the bike, oh noSo if you support me let me knowCos my run is so slowI got 21 days before I do the show21 days, t - t - t21 days, t - t - t21 days, t - t - t21 days, t - t - t"
A minor set back but what will be will be. 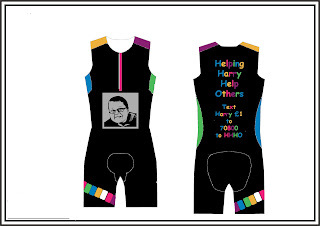 After this slight set back I decided to recommence operation design a trisuit for my endeavours next year. As you may or may not be aware I have decided to raise money for HHHO next year as it is a charity which has raised money for CRUK but has now decided to go it alone. After much deliberation and discussions with the HHHO chairperson (his mum), we decided on the design below as a starting point. What I received in return was beyond mine and Harry's mums wildest dreams. They pimped my design and made it so much better and even offered 3 new designs. I was amazed by this level of customer service. After a little deliberation Harry's mum has approved the middle design for further development and this is my favourite as well, which is a bonus. 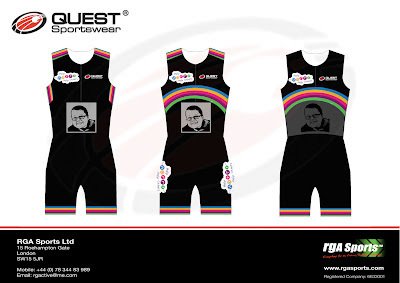 Operation Outlaw is back on as well as due to my dealings with HHHO I feel reinvigorated so I am aiming to compete at the Outlaw Triathlon on Sunday 7th July. 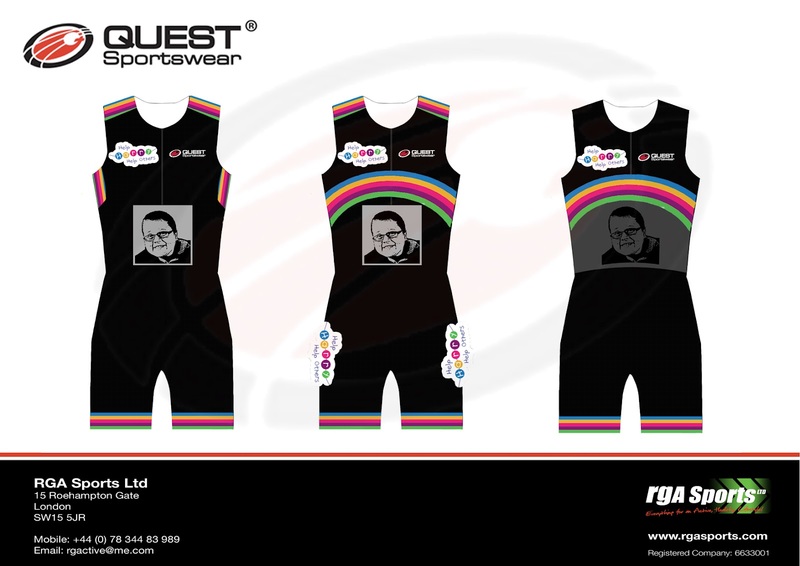 No who am I kidding I will compLete the Outlaw Triathlon on Sunday 7th July 2013. I need to knuckle on with my training over the winter now as I have a new challenge to look forward to. On the subject of training. What have I been up to this week? Erm not a lot! It's been another hectic week. Sunday - Went driving to plan a 40km looped route from home and with 4km to go, the council were resurfacing the road so instead I decided on a 40km turbo session. The run I did on Wednesday was difficult for some reason, I really wasn't feeling motivated after a long day at work. But I did it. I completed 5.9km in 45 minutes, which is not a blistering pace (even by my standards) but I completed it, which is the main thing. My legs were still achey from my attempt at high cadence running from Monday so maybe this had something to do with my slow pace. I decided to mix up my route and not follow the lamppost technique and saw a lot more of Regents Park. This was my last workout of August and unfortunately this meant I failed to complete my #12xIronman challenge for a second month. I didn't even complete one discipline, which I am disappointed with. Note to self, make sure your GPS watch is charged before you attempt a run so that it logs on the Garmin website otherwise you can't import it and have to rely on Endomondo to be able to log your run. I am hoping for a new outlook on running after this Thursday as I have booked a training session with Karen Weir who is a running coach who has worked with the likes of Jenni Falconer. Hopefully she can reinforce some of the things my PT at home taught me. The training session is before my swim at Hampton Pool with RG Active. I'm a little apprehensive about doing this reverse brick but needs must. On Sunday after I had got over my hangover and disappointment of not being able to complete my new 40km looped route due to a lot of resurfacing, I decided to get on the Turbo trainer. 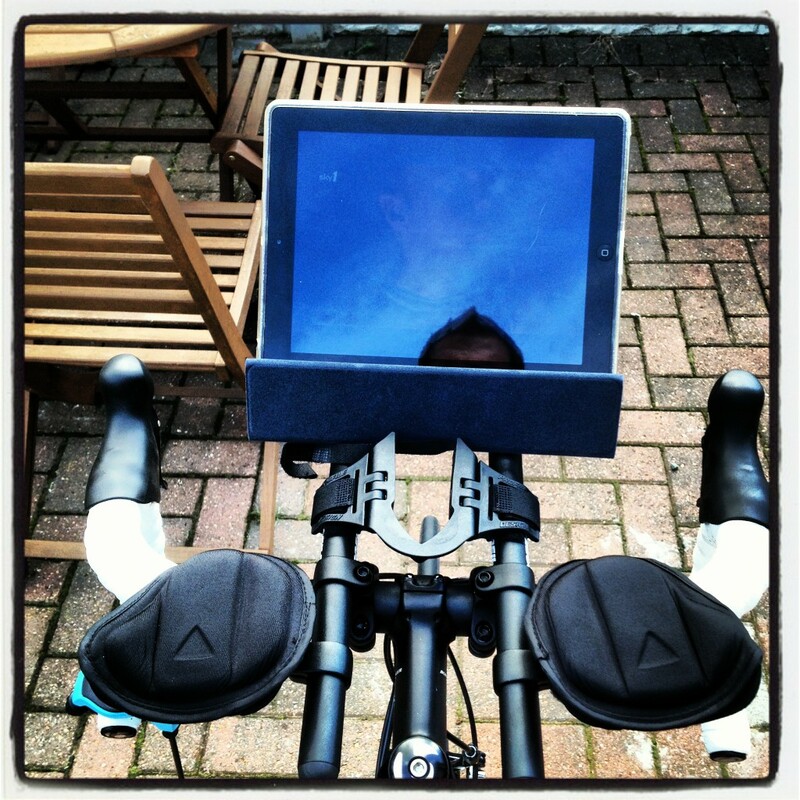 As it was a lovely day I decided to take my turbo outside and because I find the turbo boring I decided to take my ipad and watch some "An Idiot Abroad" to break up the monotony of pedalling but going nowhere. 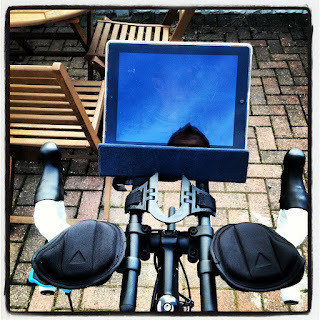 I then combined all three and realised my new tribars make a handy iPad holder. Instant bliss. I could watch videos while pedalling and going nowhere but whilst getting a tan and I had the wind to cool me down as well. This resulted in me setting a new PB on the turbo for 40km. I completed the 40km in a Brownlee like time of 00:55:04. In comparison my first ever 40km on the turbo took me 01:19:36. This equates to a improvement of 31% in just over 4 months. Now that is impressive. I also got my joining pack for London this week so there is officially no backing out now. Competitor 8763. Bring it on. 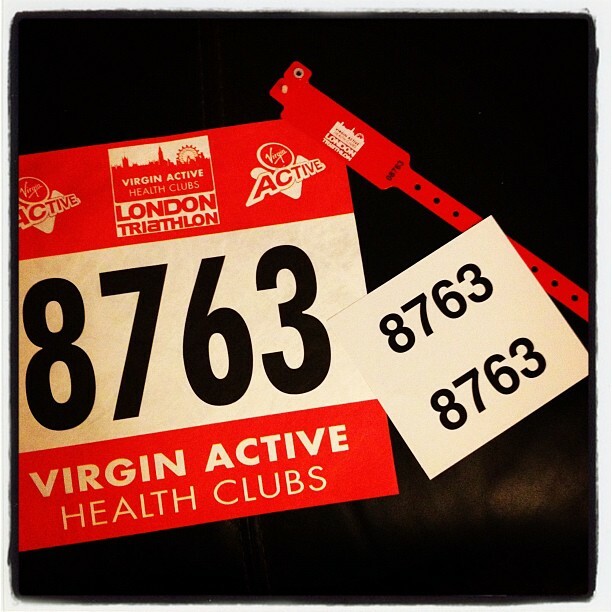 Remember you can still sponsor me via Justgiving or by texting NSMK50 £X to 70070.